RomEditor 3.1 and above supports the Transtronics Romulator real-time emulator. The Romulator is priced at $180. 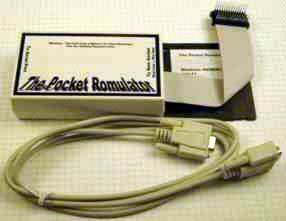 The Romulator is accessed via a standard serial port. You will need two serial ports on your laptop for tuning. One for datalogging and one for emulating. Most modern laptops are transitioning to USB. We highly recommend the Keyspan USB PDA serial adapter for reliability Try not to mix USB serial adapters. If you already have a brand that works, get another of that brand. Plug in the Romulator to your serial port. Select Transtronics Romulator from the emulation tab under settings and select the serial port. Close the settings and select Download Whole ROM from the Emulator menu. After this every change you make in ROM Editor is immediately downloaded to the emulator.